While many of Arizona's elite will venture to compete at the historic Arcadia Invitational this weekend, we've also got a few ready to throw down some big performances in front of a home crowd. 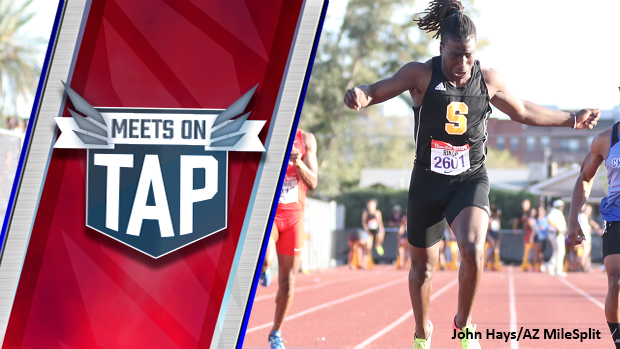 Saguaro's Kelee Ringo (Jr.) is likely the top ranked athlete set to perform this weekend at the Sun Angel Classic. Two weeks ago, he blazed a meet record of 10.43 in the Elite Boys 100-meter dash at the Chandler Rotary Invitational. There's also the returning D2 State Champion for the Low Hurdles, Ma'Kayla Dickerson (Sr.) of the Betty H. Fairfax Stampede looking to inch closer to the 41 second barrier. To date, Dickerson is the only girl to run under 42-seconds for the 300-meter hurdles. Most recently, Dickerson ran 41.92 to place second in the Elite Girls 300m Hurdles at Chandler Rotary Invitational. Finally, Taylor Starkey (Casteel, Jr.) is currently tied with Sevanna Hanson (Desert Vista, Sr.) for the no. 1 spot in the Arizona girls' pole vault rankings as the only two girls to clear 13-feet. Though Starkey will vault at home at the Sun Angel Classic and Hanson will compete at Arcadia, both of them are now aiming to break Nicole Baker's five-year-old state record. We've also got Meanwhile, Saguaro will host the Scottsdale Distance Classic this weekend. The Phoenix metropolitan area has several other meets slated for this Saturday, and the Casa Grande Cougars will host their Kiwanis Invitational, this Saturday as well.